The percentage of respondents who consider their IT environment to be somewhat or significantly more complex today than it was two years ago.1 The percentage of respondents who believe their organization has a problematic shortage of data protection skills. When the volume of production data and number of applications and devices increases, so do the demands on the data protection environment. Compounding these challenges, the data and applications that need protection now live across IT environments, including in the corporate data center, on the edge in remote or branch offices (ROBO), and in multiple clouds. In addition, 26% of respondents to a recent ESG survey believe that they have a problematic skills shortage in data protection. This puts data protection in the top three most-cited skills shortage areas. The Dell EMC IDPA DP4400 is a turnkey, pre-integrated, and converged data protection appliance designed to reduce or eliminate the time and complexity associated with deploying a comprehensive data protection solution. Dell EMC’s goal was to create a data protection solution that is simple to deploy, provides complete protection for diverse applications and ecosystems, and comes with optional long-term retention, plus optional Cloud Disaster Recovery for restoring business critical data in the event of a disaster. The IDPA DP4400 is engineered with the goal of reducing the complexity of managing multiple data silos, point solutions, and vendor relationships. The converged platform includes protection storage and software, search, and analytics—plus cloud readiness with disaster recovery and long-term retention to the cloud. Its world-class deduplication technology enables the IDPA DP4400 to be scaled from 24 to 96 TB of usable protection storage in an efficient 2U form factor, and scale to an additional 192 TB of usable data in the cloud for long-term retention. It is designed to improve backup and data recovery for a wide range of applications, physical servers, virtual machines, and multiple hypervisors while reducing the complexity of your protection environment. The IDPA DP4400 enables easy recovery, from individual files to full VMware images, which can be instantly accessed and live migrated from the appliance back to the production environment using vMotion while still running. IDPA provides diagnostic, predictive, and prescriptive analytics to help organizations better manage their current environment and more efficiently plan for growth. Inline deduplication increases efficiency by reducing storage footprint, on premises and in the cloud. 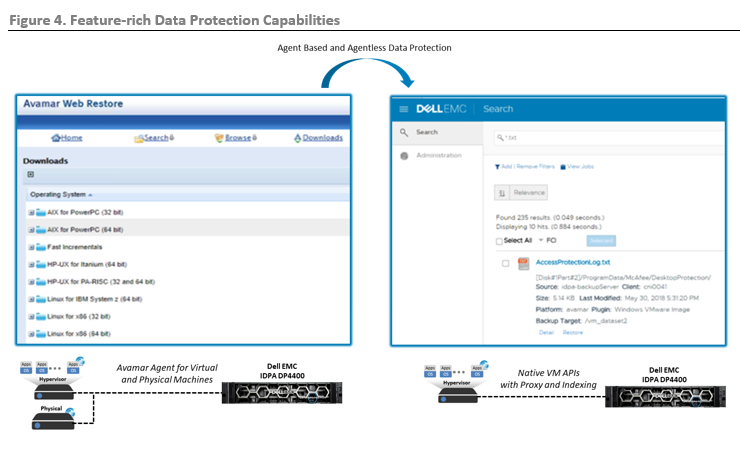 The Dell EMC IDPA DP4400 solution is illustrated in Figure 1. ESG performed hands-on evaluation of the IDPA DP4400 by participating in a hosted POC session at a Dell EMC facility in Hopkinton, MA, and by participating in a customer deployment to capture the entire experience from out of the box rack-and-stack, all the way to first backup in an actual production environment. Our customer-based deployment started by removing the IDPA DP4400 from its shipping material and physically installing it in 2U of free rack space in an existing 42U server cabinet. The spring-loaded rail kits and slide-on rails made it easy to install and it required no tools. We had two people lift the appliance and slide it into the rack. Then the two power cords and four network connections were made according to the quick start guide. Figure 2 summarizes the configuration process once the appliance has been racked, powered on, and physically attached to the production network. The first time the power button is pushed, the IDPA DP4400 boots from the pre-installed ESXi operating system. At this point, the Appliance Configuration Manager (ACM) is the only VM up and running. Initially, and to avoid network conflicts, the ACM is assigned a static IP address on an unused NIC port. Using a regular network cable, ESG simply connected a laptop with a quick start provided IP address to the ACM NIC port. We launched a web browser to connect to the ACM UI and configure it to the production network. This process required only simple network settings like DNS, DomainName, IP address, gateway, and subnet mask. As shown by the teal icon and timeline in Figure 2, this process took about five minutes. Once the ACM was connected to the production network, we moved to an office to finish the full IDPA DP4400 configuration. As shown in Figure 2, ESG reconnected to the ACM management interface over the production network. 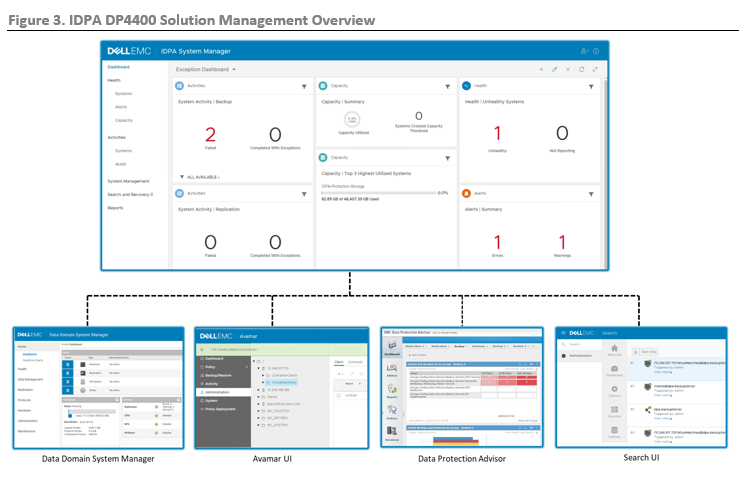 With a little upfront network planning, the full IDPA DP4400 configuration can easily be reduced to five UI screens, with only three screens requiring user input. Preparation/planning amounts to identifying a group of ten consecutive unused IP addresses that will be automatically assigned to the appliance components and confirming the networking service IP addresses that will be leveraged. As shown by the gray icon and timeline in Figure 2, the final configuration took about 20 minutes and consisted of browsing to and adding our license files, pointing to network services, assigning IP addresses, confirming settings, and clicking go to start the automated deployment. It took about 90 minutes to fully configure the IDPA DP4400. Next, as shown in Figure 3, ESG connected to the IDPA System Manager interface. This interface is designed to provide single pane of glass management for the solution. It enables the administrator to monitor system and backup health, run backup policies and jobs, check and audit activities, and run status reports. It should be noted that the individual component UIs are still available to the system administrator if they are needed for a specific task or operation. Finally, to demonstrate the depth of the IDPA DP4400 data protection solution, ESG ran several backups and restores using different data protection schemas. The solution supports both agent-based and agentless backups and restores. This is an important capability, especially for a heterogenous environment. 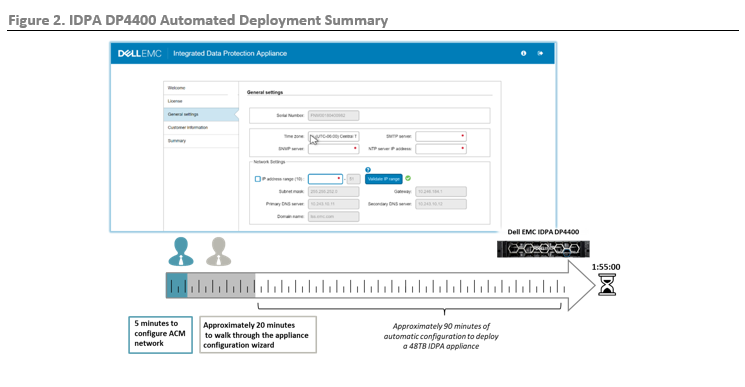 As shown on the left side of Figure 4, all the Avamar agents, from AIX to Oracle Database agents, are available in the IDPA DP4400 solution. For highly virtualized VMware environments, native data protection APIs can be used in conjunction with Avamar proxies for added performance and functionality. ESG conducted both an agent-based and an API-based backup and recovery of a Windows VM. In both cases, we were able to do individual file level restores, even from the VMware API image backup. The IDPA DP4400 indexing and search capability shown on the right side of Figure 4 enabled file-level restore from VMware API image backup. This feature can be leveraged as needed for any VM in the protection environment. IT environments are getting more complex due to higher volumes of data, greater numbers and variety of endpoints, and greater numbers and variety of applications. No one wants the tools and applications that they use to manage these environments to follow suit, especially in areas like data protection where specialized skills are in short supply. However, simplicity alone is not always the answer if the tools and application don’t have what it takes to do the job. ESG confirmed that the IDPA DP4400 has what it takes to simplify data protection environments and get the job done. The deployment took a little time (one hour and 55 minutes total), but most of that was automated and unattended. And, once configured, it delivered protection storage, protection software, search, advanced monitoring and analytics, and optional cloud long-term retention and Cloud Disaster Recovery in an efficient 2U package. Digital transformation has fundamentally changed the IT landscape, driving up the diversity of applications and devices, which in turn generates data at volumes not seen before. These factors make data protection more challenging than it has ever been. Unstructured data growth, increasing adoption of virtualization and public/private cloud architectures, broadening compliance regulations, IT modernization initiatives, and ever more aggressive service level agreements are all contributing factors. Meanwhile, organizations are demanding reduced risk, downtime, and expense from their data protection teams. 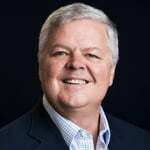 All these changes hit the mid-sized business especially hard, as those organizations traditionally have not had the resources, both in terms of infrastructure and personnel, to meet rising data needs. ESG confirmed that the IDPA DP4400 from Dell EMC has been specifically designed to make addressing these data protection challenges, from deployment to daily management, as easy as possible for mid-sized businesses. To validate this, ESG walked through the entire deployment process from delivery to first backup in a mid-sized production environment. We had the IDPA DP4400 off the delivery truck, installed in a rack, and powered up in about 30 minutes. This even included moving the rack location of the IDPA DP4400 one time before power-up to make room for a future network switch upgrade. To streamline the deployment process, ESG leveraged the quick start guide and prerequisites checklist to create a list of IP address and network service settings that would be used in the configuration process. We spent about five minutes in the server room adding the Appliance Configuration Manager to the production network and another 20 minutes in an office cubicle adding the final configuration settings. The rest of the IDPA DP4400 setup was completely automated. We simply monitored the process occasionally until the appliance was fully configured. It should be noted that before we completed the onsite deployment, ESG attended a hosted POC deployment at an EMC facility to provide ease-of-deployment feedback on early beta code. We were impressed at how quickly and completely the Dell EMC development team integrated feedback, bug fixes, and enhancements into the version of code we later used for the onsite deployment. For IT professionals, especially in areas like data protection where specialized skills are in short supply, keeping pace with today’s always-on, always-up business environments can be very challenging. Data is increasingly distributed and continually growing, while applications and data are increasingly fragmented. To satisfy the complex needs of the business, IT needs to protect data at its source while improving time-to-value, reducing cost and complexity, and planning for future growth. If your organization is feeling the effects of accelerated data growth and increasing complexity and it is interested in simplifying its data protection ecosystem, ESG believes it would be smart to include a pre-integrated, turnkey, converged appliance from Dell EMC in your evaluation process.